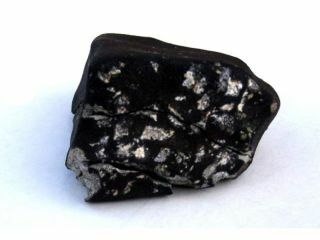 This fragment of the meteorite that exploded over Wisconsin on April 14 was recovered by a pair of space rock hunters. The largest chunk yet of a meteor that exploded over Wisconsin last monthhas been found by intrepid space rock hunters. But the remnant, which brokeinto three pieces after hitting the ground, is still small enough to fit in thepalm of your hand. Marvin Killgore, thecurator of meteorites for the Lunar and Planetary Laboratory at the Universityof Arizona, and his wife, Kitty, arrived in Mineral Point, Wisc., just days after theApril 14 fireballsighting, and now have a 10.6-ounce (300-gram) chunk of space rock that maybe the largest piece of the meteor found so far. On April 14, people in southwestern Wisconsin and northern Iowa bore witnessto a sonic boom and fireball that briefly lit up the late evening sky. Theobject, an ancient rock from space, entered the Earth's atmosphere as a ball offlames after a 4.5 billion year journey through the solar system. NASA officials estimated that the meteorite, which measured about 3.3 feet(1 meter) across, exploded with a force equivalent to 20 tons of TNT. Meteorite hunters from around the world quickly flocked to the Wisconsin farmcommunity that has become ground zero for the meteor fall to try to get theirhands on a piece of the debris. A farmer discovered the firstfireball fragment the morning after it exploded. The Killgores foundtheir fragment on a road near a local candle factory. The rock was split intothree pieces on impact, and was even marked by the gravel road where it landed. The Killgores' spacerock is a breccia – a conglomeration of rock fragments cementedtogether. It most likely originated in the asteroidbelt that orbits the sun between Mars and Jupiter. "Thisone is relatively pristine, handled by very few human hands," Killgore said. "And ithasn't been on Earth all that long. It's exciting to be the first one to seesomething like this, to pick it up and hold it in your hand, and to know thatit just came from somewhere away from here. It'spretty awesome." There are likely other larger fragments of the Wisconsin meteor still outthere that will be found in the coming years, Killgore said, but these pieces will also be moreweathered. The Killgores work withMarc Fries, a scientist at NASA's Jet Propulsion Laboratory in Pasadena,Calif., to locate meteorite fragments. Using Doppler weather radar maps, theycan triangulate the trajectory of objects that make it through Earth'satmosphere and reach the ground. Since explodingmeteors create clouds of debris (similar to atmospheric clouds) that arepicked up by radar sensors, the area where pieces of the meteorite land can bedetected using these meteorological devices. "The pieces can fall anywhere," Killgore said. "It's basically like tossing ahandful of gravel into the grass and then seeif you can find them." The meteorite-hunting duo has already amassed oneof the largest collections of meteorites in the world, with their heftiest findweighing a staggering 1,600 pounds (726 kg). A different sample from the meteorite had been previously found by a localfarmer, who sent it to the University of Wisconsin for examination. It wasfound to contain traces of magnesium, iron and silica compounds, in addition toother common minerals such as iron-nickel metal and iron sulfide.